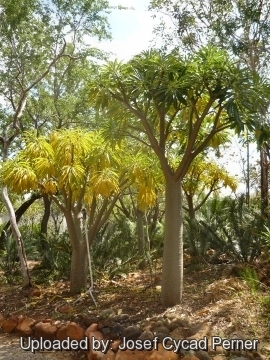 A large specimen growing at the Réunion Island. Origin and Habitat: Pachypodium rutenbergianum covers a wide area, ranging from the southwest corner to northwest tip of Madagascar. Altitude range: From near sea level to 400 metres. Habitat and ecology: Low open deciduous western forest, coastal bush, scrubland and savanna on Mesozoic or Tertiary calcareous rocks, sand (dune and unconsolidated sands), sand with laterite and granitic rocks. Pachypodium rutenbergianum var. sofiense Poiss. Pachypodium rutenbergianum var. perrieri Poiss. 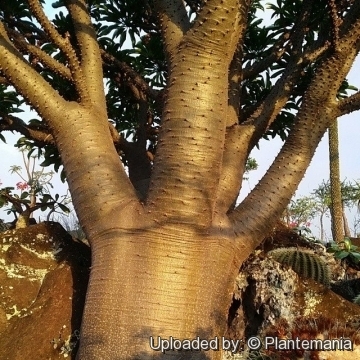 Description: Pachypodium rutenbergianum is a candelabrum-shaped tree forming a stout, succulent, bottle-shaped trunk and is the largest of the pachypodiums, 3 to 9 m tall (occasionally it may reach 15 m with time). It has a heavily branched crown of thick forking branches. The showy pure white often with yellowish-green centre flowers are large, asymmetrical and smell of perfume. The leaves form around the growth tips of the trunk and branches and have a downward curvature in the length. Trunk: Bottle-shaped or cigar shaped up to 6-9 m (or more) in height and 15-100 cm at the base. Bark grey, grey-green or pale silvery brown, smooth or with leaf scars. The branches are heavily armed with spines. First branches narrowly ovoid, 5-20 cm in diameter at the base and tapering at the apex. Branchlets 1-3.5 cm in diameter, covered with spines. Spines: Paired, conical and laterally compressed, straight or rarely curved, brown, 3-15 mm long, 1-10 mm wide at the base, occasionally with one (or two) ascending central(s) between. Leaves: Deciduous only growing at the very tips of the branches, shortly petiolate ( petiole 5-60 mm long, up to 5 mm in diameter, glabrous) . Leaves blade softy coriaceous or herbaceous (papery when dried), glossy green, narrowly oblong (2-10 x as long as wide), with pointed ends, cuneate at the base, 3-45 cm long, 1-8 cm wide glabrous, green with a lighter green vein running the length of the leaf on both sides and 35-75 pairs of dark secondare red veins on the underside, tertiary venation reticulate if conspicuous. 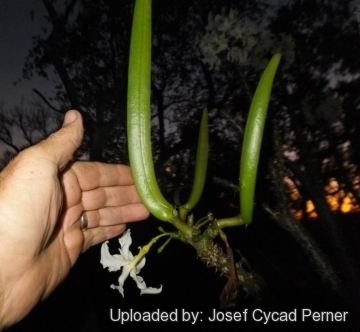 Inflorescence: 3-30-flowered, compact, 7-20 cm long at the stem tips. Peduncle absent or up to 20 mm long , glabrous, pale green with 1-4 branches and which may be about 10 cm long. Pedicels 10-20 long, glabrous. Bracts elliptic to oblong, 4.5-7 mm long, acuminate at the apex, glabrous on both sides. 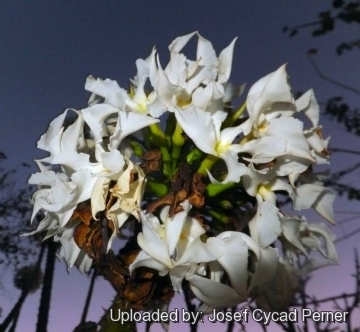 Flowers: Large, very pretty and showy, white with a yellow center, sweet-scented, .4-6 cm long, 3.5-7 cm in diametrer, resembling those of plumeria. Sepals 4.5-6.5 long pale green often with brown edges, always shorter than the basal part of the corolla tube, ovate acuminate at the apex, glabrous on both sides Tube fleshy, 30-47 mm long, basal part almost cylindrical, upper part conical and 6-8 mm wide at the mouth. Corolla limb white often pale greenish-yellow inside in the throat, forming a comparatively wide narrowly ovoid head. Lobes, obliquely ovate 30-50 mm long 17-25 mm wide, undulate at margins, fleshy and auriculate at the base at the right side, acuminate to acute at the apex. Stamens not exerted. Anthers very narrowly triangular, 12-15 x 2-2.5 mm, hairy at the base. Pistil 15-20 mm long. Ovary glabrous ca 4 mm long, style filiform, 9-13 mm long. pistil head 1.5-2 mm high. Fruits (mericarps): Usually growing in pairs forming an angle 10-90° at the base, but sometimes only one developing, cigar-shaped to fusifonn, straight, tip acute to obtuse, about 16-30(48) cm long, 1.3-3(4.5) cm in diameter, smooth, green, sometimes with apex dark red, turning dark brown when ripe, pale brown inside, valves often curved or curled when dry. 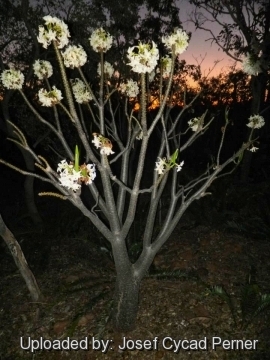 Phenology (in habitat): Flowering April-August (-November) and fruiting August-November. 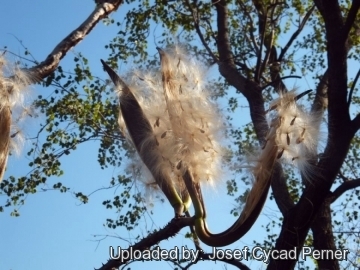 Seed: Pale to medium brown, elliptic11-15 mm long, 5-8 mm broad thickened at the margin on both sides, with a coma (a prominent tuft of silky hairs) straw-coloured or pale brown, 3-6 cm long. Pachypodium rutenbergianum Vatke: ( var. rutenbergianum) Plants to 6 m tall, with narrowly elliptic to linear leaves at least 4 times as long as wide; Corolla pure white; Fr less than 3 cm in diameter. Distribution: north and south Madagascar. Pachypodium rutenbergianum var. meridionale H.Perrier: Tallest of the varieties (up to 8 metres tall) but with the smallest fowers, with corolla lobes flushed pink or red-veined. Distribution: SW Madagascar. Pachypodium rutenbergianum var. sofiense Poiss. : Leaves obovate, 1.8-3 times as long as wide; Corolla lobes blunt and only slightly crisped; Fruits to 6 cm in diameter. Distribution: NW Madagascar. 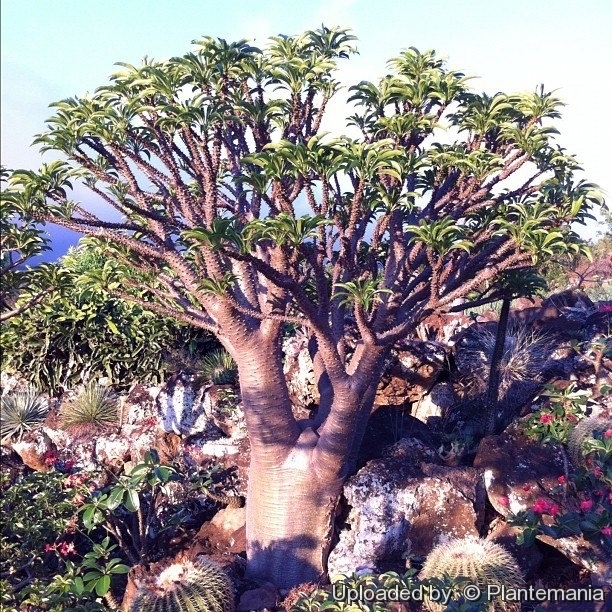 4) Perrier de la Bathie, H. “Les Pachypodium de Madagascar.” Bull. Soc. Bot. France 81: 297–318.1934. 5) Rapanarivo, S. H. J. V. & A. J. M. Leeuwenberg. “Taxonomic revision of Pachypodium. Series of revisions of Apocynaceae XLVIII.” Pp. 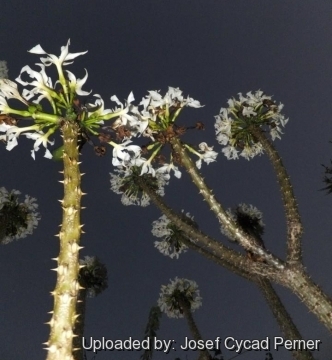 44-49 in: Rapanarivo, S. H. J. V. et al., "Pachypodium (Apocynaceae): taxonomy, habitats and cultivation." CRC Press, 1999. 10) Das, A. B., S. Mohanty & P. Das. 1998. “New report on chromosome number, karyotype and 4C DNA content in three species of Pachypodium Lindley.” Caryologia 51(3-4): 245–252. 12) Poisson, H. & R. Decary. “Nouvelles observations biologiques sur les Pachypodium malgaches.” Bull. Trimestriel Acad. Malgache, n.s., 3: 241–246.1922. Cultivation and Propagation: Pachypodium rutenbergianum is one of the largest species in the entire genus that can be grown both indoors, as well as outdoors in tropical climates. Rots easily in winter when cold and extended wet. It more winter tender than other Pachypodiums. Growth rate: Relatively fast growing for a Pachypodium. It is probably the largest also, easily attaining tree proportions and an impressive caudex can be steadily developed. In the winters it is deciduous, except in very tropical areas. Uses: It may be grown as a specimen among rocks and low-growing plants in a hot rockery. It may also be grown in a heavy container on the sunny patio. This is perhaps one of the most difficult species in the genus to cultivate, as in winter there is a tendency for the tips to die back. Soil: Needs a gritty, porous cactus potting mix that's not strongly acidic. Watering: Water sparingly in the heat of the growing season to encourage new growth, foliage and flowering, and give extra well-drained soil to avoid waterlogged conditions, no water from late autumn to mid-spring. The watering program will change depending on temperatures and stage of growth, but it is best not to let this plant dry out completely for any length of time. Indoors it is best to keep it on the dry side, or it is prone to rot. Outdoors it must be protected from the rain in winter. Do not let this specimen sit damp in cool weather. The older it gets the less water it must receive! Hardiness: It is sensitive to cold and should be kept totally dry in winter at or around 10°C, but it demonstrates some cold resilience if dormant and the soil is bone dry in winter. Protect from frost. It tends to lose its leave and go dormant in winter (USDA Hardiness zones: 10 – 11). Exposure: It like full sun to light shade. 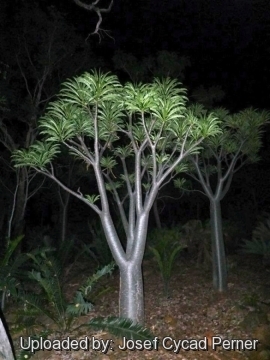 Maintenance: This Pachypodium will not require any pruning to look like a very interesting and unusual fat tree, but after several years it can outgrow its indoor location, requiring a 'pruning'. It has amazing regenerative properties. Repot: Repot the plant every 3 years; this is quite tricky given all the spines. The best way is to wrap several layers of newspaper around the trunk where it is to be handled. Indigenous Practices: The bark of this plant is sometimes mixed with Raphia to make a textile. Warning: This plant has spines use caution when handling. Propagation: Seeds or (rarely) cuttings. Fresh seeds results in a remarkable yield of new plants, perhaps 90% and seedlings grow fairly easily. Soak seeds in warm water for 24 hours before sowing in a 5 mm deep, sterile, moist sandy medium (4 parts fine and 4 parts coarse river sand 1 part sieved, well-rotten compost; 1 part perlite; 1 part vermiculite. Keep the mix moist and at a temperature of 27–35°C to ensure rapid germination. Seed start sprouting in just 3-4 days ( but continue to germinate erratically for about 6 month) they are also propagated by removal of branches from old plant (if they need to be pruned). They should be allowed to dry for 5 to 8 days before potting up, however the cuttings often fail to root. Seedlings grow fairly slowly compared to other Pachypodium species. Young plants have more conical spines and begin early to swell nicely, branch and even flower.